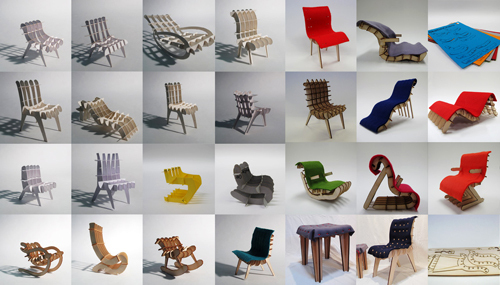 The SketchChair software allows anybody to take part in the process of designing and building their own chairs. The program lets users design chairs using a simple 2d drawing interface, automatically generating the structure of a chair and testing its stability. Users can simulate sitting on a chair with a customizable figure of themselves, in order to test and refine the chair to ensure it will comfortably support them. The software automatically generates cutting profiles for the chairs, which can then be used to make physical SketchChairs. Using a cnc router, laser cutter or paper cutter, these parts can be cut from any suitable flat sheet material, and then easily assembled by hand. We have launched SketchChair as a Kickstarter campaign, to try and raise funds to complete the software and release the source code, and to start building an online community of people creating, sharing and editing designs.